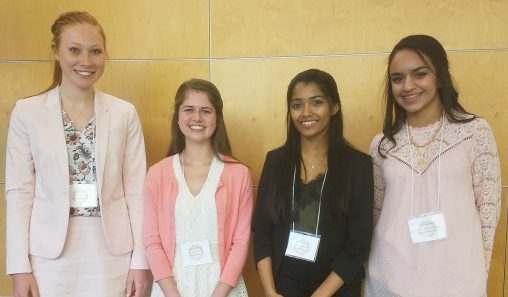 From left: finalists of the rotary speech competition at Wright State: Bella Fiore, Katelyn Niehaus, Rithu Rajagopala and Zane Bekheet. High school students came from all over Ohio to participate in a four-way rotary competition hosted by the Wright State Department of Communication on April 8. The four-way rotary test asks four questions: Is it the truth, is it fair to all concerned, does it build goodwill and better friendships and will it be beneficial to all concerned? Participants wrote speeches comparing a personal topic to each of these standards and presented their speeches to a panel of faculty judges. High school students came from high schools all over Ohio, from Cincinnati to Eaton to Sidney to compete at Wright State, a central location for all the schools involved. Mary Rucker, chair of the Department of Communication, said she was thrilled to host the event at Wright State. The competition consisted of two rounds, with eight groups of up to five contestants. Each student gave a speech that ranged from four to six minutes about a topic of their choice and how it related to the four-way rotary test. Topics ranged from light-hearted, like fundraising candy bars or an extracurricular program for students to meet with nursing home residents to serious topics like the effects of drunk driving or banned books. After two preliminary rounds, the top four contestants gave their speech again in front of a panel of judges, three of who are Wright State communication faculty members — Rucker, David Baxter and Melissa Spirek — as well as Bill Shula, a rotary district governor. First place in the competition went to Rithu Rajagopala, a junior at Walnut Hills High School in Cincinnati. She spoke about the effects of societal beauty standards on people. Beth Huber, district chair of the Rotary Club, said she was glad to be at Wright State for the competition.